The Space Under Your Deck: Disguise it, hide it, or better yet, use it! As homeowners continue to extend their properties from the inside out, it’s important to wisely use your available outdoor space and balance the need for a yard too. The ideal project combines space-savvy building methods with a zesty design to create a good lookin’ but incredibly useful outdoor space. Whether you want to accommodate a small garden, large swimming pool or plenty of wide-open space for the kids to play, your deck design should meet those requirements. But no matter your lifestyle, it’s often those oh-so-subtle design details that will tip the scales between a boring or brilliant outcome. And an experienced deck contractor will never (ever!) forget about the need for both functionality AND aesthetics. A perfect example of that ‘special-little-something’ to add project ‘zing’ is how the underside space of your deck is managed. Of course you can leave the underside of a deck, ‘as-is’ but it’s better to disguise it, completely hide it or better yet, use it! If your deck is low to the ground, disguise it. A little landscaping or skirting (or both) will certainly do the trick, giving your new outdoor space a finished look. 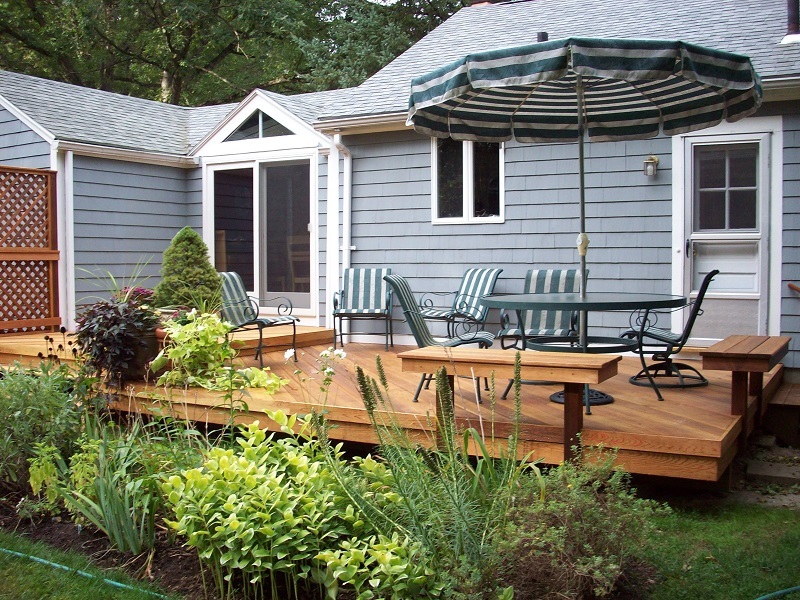 Start with simple yet attractive beds around your deck’s perimeter to save money. Add to the beds yearly for a more elaborate look. Lattice or solid planks, native plants, easy-to-care-for shrubs and flowers are popular options to polish-off a rough substructure. 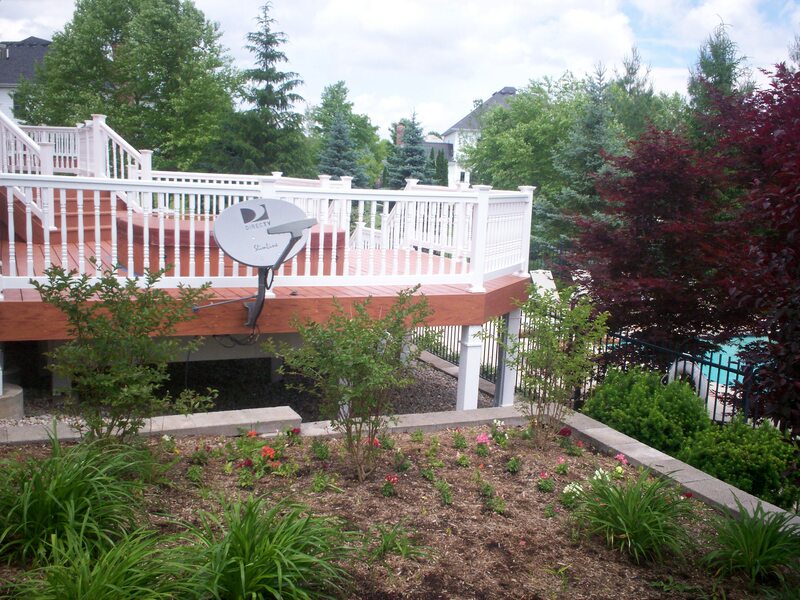 If your deck is elevated but the space beneath is a bit shy on height, then by all means hide it. And while you’re masking it, why not add a hinged door or removable panels to create a storage hideaway? Many homeowners use this spot to tuck away lawn mowers, rakes, shovels or even children’s toys. 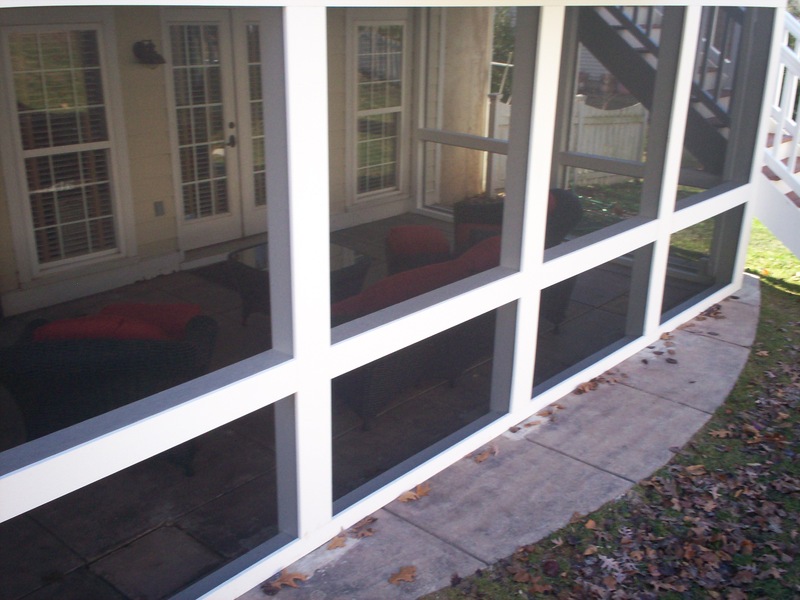 When concealing the space be sure there’s proper air-flow which is important for your deck’s longevity. When done right, built-in under deck storage is convenient, practical and gives you the most bang-for-your-deck-building-buck. 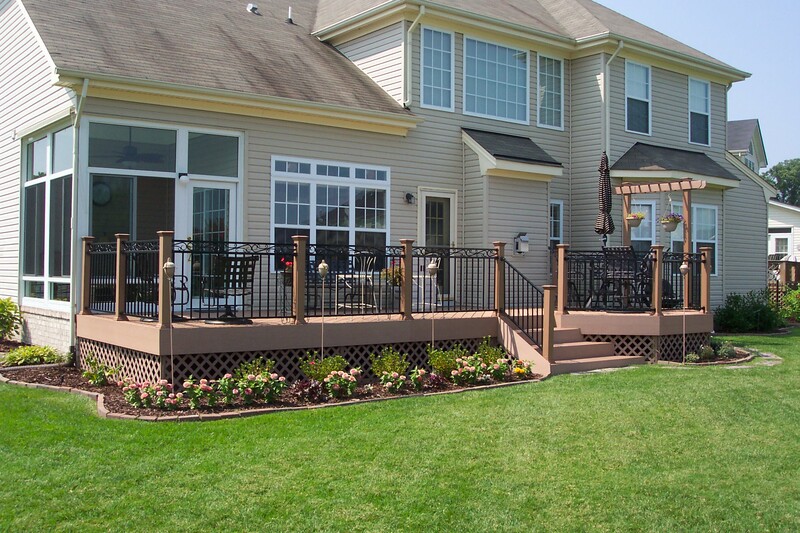 If your deck is tall enough for standing-room you have two additional options. Use the area beneath as an open porch or enclose the area as an outdoor room. At a minimum, considerations for an open porch include post covers and flooring. 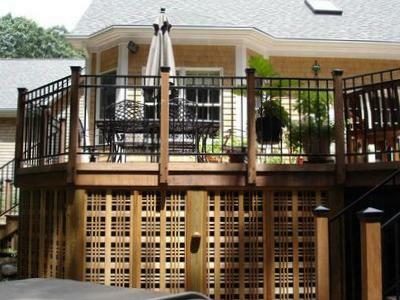 Decking posts are constructed with timber; however, they can be wrapped in decorative sleeves. Some folks add a stone feature too. Flooring options can include concrete, pavers, flagstone, clay brick or even gravel. In addition to a floor and post covers though, most homeowners include an under deck ceiling for an open porch. Underdecking is a way to drain water away from your home so that rain or other moisture doesn’t drip below from the small gaps of a deck’s floor. So if you’d like to enclose the area under a tall deck as a screen room, an under deck ceiling is a must-have feature. 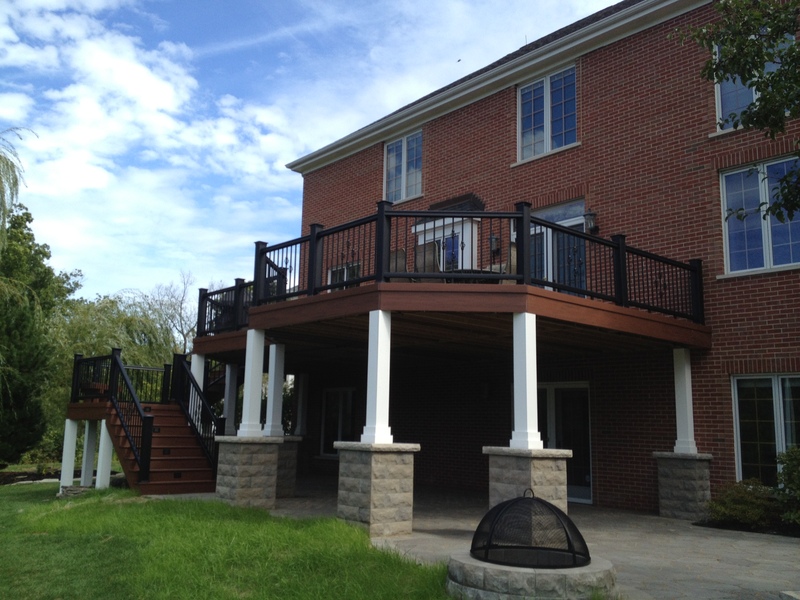 If you’re looking for a reputable contractor to add a deck, screen porch, pergola, gazebo or other outdoor living space to your home and you live in the Greater St. Louis, Missouri area, please consider Archadeck. Archadeck of West County and St. Charles County is locally owned and operated with offices in St. Louis West County. Please give us a call anytime – 636.227.0800. To visit our local website go to west-county.archadeck.com. There you’ll see photo galleries of our completed projects around-town, an online inquiry form and other links. If, however, you’re still exploring ideas, our new Pinterest and Google+ pages might be helpful resources too. Sources: Metro West Boston Archadeck, archadeck.com, Bob Vila, Today’s Homeowner – Outside of St. Louis, visit archadeck.com to find other locations. 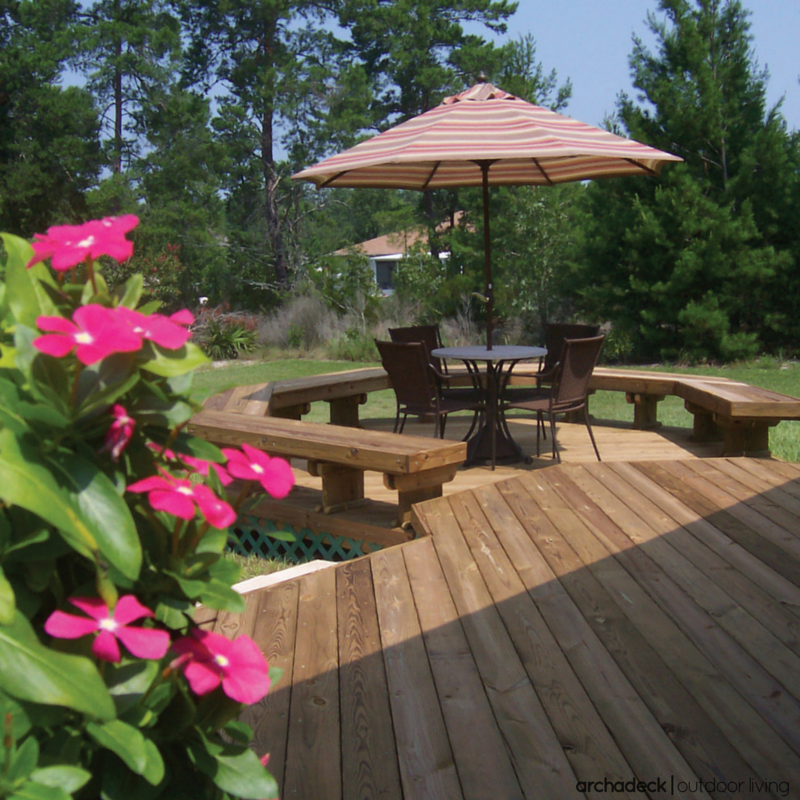 Wood Platform Deck with Built In Benches, Under Deck Lattice Trim and Landscaping, Deck Project by Archadeck – Pin It For Later!